Mannie is going on an adventure. She's taking her favourite elephant Lilliput and her doll Strawberry Luca. And she hasn't forgotten her special box of secret things, just in case the adventure gets adventurous. 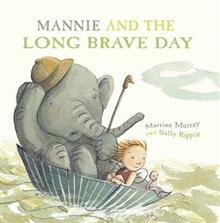 A magical story that celebrates friendship, courage and the wonder o... read full description below. Martine Murray was born in Melbourne, and still lives there. She has studied acrobatics, dance, yoga and writing. In addition to her Henrietta books, she has written two picture books, illustrated one, and written three novels that have sold extensively overseas. Sally Rippin was born in Darwin, but grew up mainly in South-East Asia. Sally is the author of many books for children, including the popular Billie B Brown series and, most recently, the Polly and Buster series. She lives in Melbourne and writes and illustrates full time. Martine and Sally are friends, and they wanted to make a book together. This is it.